Families across the UK are helped to save money, sort food facts from food fiction and eat well for less. In Cheshire, Gregg and Chris assist the entrepreneurial Saynors. Gregg and Chris are in Cheshire to help the Saynor family, whose work is taking over their kitchen. Kelly and Justin have been married for four years and have two businesses together, but their successful careers have come at a cost. Work for these two is 24/7 and accompanies them home every evening which means their kitchen table has been taken over by their home computer. As a result the family rarely eat together around the table. Life for the Saynors is fast-paced and often Justin and Kelly miss breakfast and lunch - and dinner is all about speed. When it's not one of two recipes they know they can cook quickly, it's a ready meal, a takeaway or their absolute favourite option, a meal in their local restaurant. Not only is this expensive but it's not a healthy way of eating. 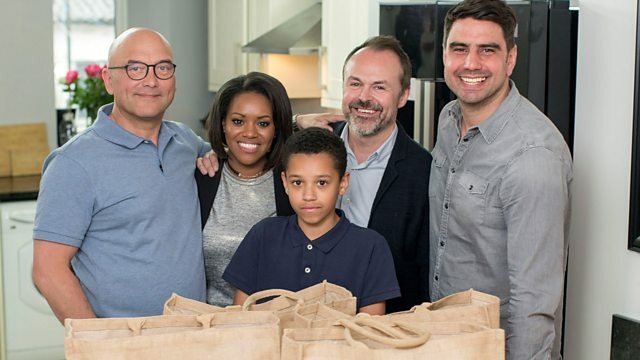 If Gregg and Chris can come up with quick, easy, nutritious recipes, this family could start enjoying healthier meals together, but will they get the Saynors to slow down long enough to get back to basics, cooking and dining in rather than eating out? See all episodes from Eat Well for Less? Slash your food bill. Gregg Wallace tells you when to BOGOF.